I live in a world with only two Zatoichi films. The first film, Revenge, makes all kinds of allusions to the character's past life and past world. I mean, it’s centered on the death of a master whose role is only vaguely hinted at, and he is surrounded by people who knew him back in the day (or have at least heard of him). Vengeance, on the other hand, is self-contained. Nobody knows who Zatoichi is, and the film doesn’t even assume that you do. If you know the film is about a blind swordsman, you’re golden. So, Zatoichi’s Vengeance serves as a better introduction to the character of Zatoichi than Zatoichi’s Revenge does. Even so, I’m glad I saw Zatoichi’s Vengeance second. In my two-film world, Zatoichi’s Vengeance is The Dark Knight to Revenge’s Batman Begins. (It’s an imperfect analogy, but stick with me.) Revenge is the origin story. Here is a man who returns to his old stomping ground to find out that his master has been killed and his master’s daughter has been pulled into prostitution and treated horrendously. Even without any real context, these are pretty good reasons to follow a man as he exacts his revenge upon the people who have wronged him, his master, and his town. For whatever reason, the word “vengeance” feels darker than “revenge.” They technically mean the same thing, but VENGEANCE is an excessive, horrible thing, whereas revenge is honorable, logical, and acceptable. And so, Zatoichi’s Vengeance is a much darker film than Revenge. Though Zatoichi defeats evil in the end (there are literally a dozen films left to go), it’s bittersweet rather than triumphant. ­Vengeance, you see, is about Zatoichi’s weaknesses, his imperfections. Here is a blind man masquerading as an ultra-heroic swordsman. Without his bladed cane, he is nothing more than a bumbling fool. But even with the cane in hand, he's still human. Zatoichi happens upon another blind man, a Biwa-playing priest who has been blind since birth (unlike Zatoichi, who apparently developed the condition as a child). The priest’s senses are even better than Zatoichi’s (he sensed Zatoichi from a hundred yards away, whereas Zatoichi didn’t notice him until they were mere feet apart), and he speaks cryptically about Zatoichi’s outsider status. He can’t fit in with blind men or with sighted ones. To them, he is just a freak. After following the priest’s advice and heading to an apparently-quiet town, he finds that this place has been overrun by a gang boss who is making everyone pay him lots of money to keep their businesses open. And so we are subjected to Zatoichi being savagely beaten and nearly drowned in front of the small boy. Despite the weapon of choice and the body count, neither Zatoichi film is particularly blood-soaked, but Zatoichi’s face after that beating is drenched. It’s tough to watch, but it is undoubtedly the most compelling scene in either of the films. This is a man trying to do right by a young boy who he feels responsible for, a boy he really doesn’t know at all, and he must suffer in the process. Seriously. It’s fascinating. And it’s made all the more fascinating by having seen Revenge (and presumably the other early films). The moment where he admits to being afraid is powerful no matter what, and would work even in this self-contained story, but with greater context comes greater responsibility, and it’s all the more heartbreaking to see his fall from glory. As he walks off into the sunset at the film's end, the people he tried his hardest to help are distraught. Death has consequences, something that Revenge never really acknowledged. Vengeance does, and is far more powerful because of it. I agree with a lot of your take! 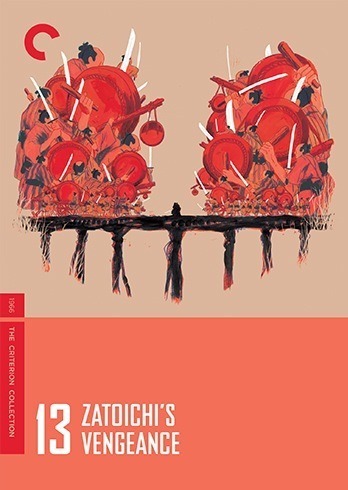 I just finished Zatoichi's Vengeance (the 13th episode in the Z series). It might have the best plot, dialogue, and acting thus far in the series. The priest and the prostitute carry the film.